When searching for educational children's worship material, be sure to use lessons rooted in Scripture. 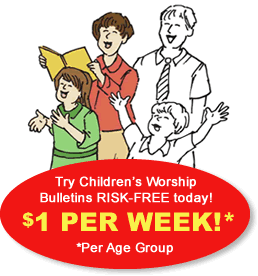 Our Children's Worship Bulletins are based on familiar Bible passages. In fact, over a three-year period, significant lessons from the Old Testament, the four Gospels and the Epistles are covered. Children's Worship Bulletins are designed to fit on both sides of standard 8-1/2" x 11" paper, giving you four full panels of lessons in each. Add your church's contact information, date, logo or other desired information to make each a customized bulletin. Then, use the content to create easy and fun classroom activities to engage kids from 3-12. In this short article, we'll show you how to use our children's church bulletins about Mother's Day to create simple and doable activities for any church event. Engage the children in a conversation before reading the lesson. Ask, "Can anyone tell me what a 'prayer' is?" Accept reasonable answers. Continue, "Today, we're going to hear a story from the Old Testament about a woman who prayed to God. While I read the lesson, please complete the puzzle 'Hannah was sad because she had no children ...' Then, we'll talk more about prayer and how you can pray too." Read aloud 1 Samuel 1:1-28 while the children work on their puzzles. Continue, "What do we know about Hannah's prayer to God?" Accept answers such as "she wept bitterly," "she was praying in her heart," "her lips moved, but she didn't make any sound," etc. Continue, "In the New Testament, Jesus tells us how pray — we call it the 'Lord's Prayer'. Does anyone know it? Let's learn it today." Recite the Lord's Prayer, a line at a time. Have the class repeat it with you until they have learned it. Incorporate hand motions or other movements to help the children commit the prayer to memory. Continue, "Do we know if God heard Hannah's prayer?" If necessary, lead the children to an affirmative response. Continue, "Do you know if God hears your prayers? Jesus assures us that God hears every one of our prayers. You can pray to God about anything — like Hannah, even if you're so sad that you're crying. God will hear your prayers. Let's end today's class by reciting the Lord's Prayer again." End the class by reciting the Lord's Prayer. Give each child a bulletin, the enlargement on cardstock, a pair of scissors and the pencils, markers and/or crayons. Explain the activity, "Mothers play important roles throughout the Bible. Today, we'll learn about one of those mothers." Continue, "Let's look at the first page of our bulletin. The instructions for the puzzle 'The Bible tells us of many special mothers' tell us to 'Copy the squares on the other half of the grid to complete the picture.' Instead of completing the puzzle in the bulletin, I've enlarged it onto cardstock. While I read the lesson, please complete the puzzle on cardstock." Read aloud or have the children read aloud 1 Samuel 1:1-28. Have the children color their completed picture and cut it into squares based on the grid lines to create another puzzle. Allow them to put their puzzles together and/or have another student try to solve their puzzles. They can take their puzzles home in the provided zipper bag.